Traditional and characteristic country house, situated in the midst of lush vegetation with sea views. The large porch on the front of the house is the perfect place to relax, dine 'al fresco' on warm summer evenings. This house is a fine example of Sicilian architectural features such as original wooden door dated 1800, hand-made tiles, outdoor benches, etc.. Interior: As soon as you enter the living room / dining room you can admire the beautiful fireplace on the left, the dining room to the right and in front of the kitchen. On the other side of the house are the master bedroom and double bedroom with bathroom. Outside: The house is on one floor with a terrace covered with a tile roof on the front. There are two concrete benches at the sides, the ideal place to admire the vegetation surrounding the house. 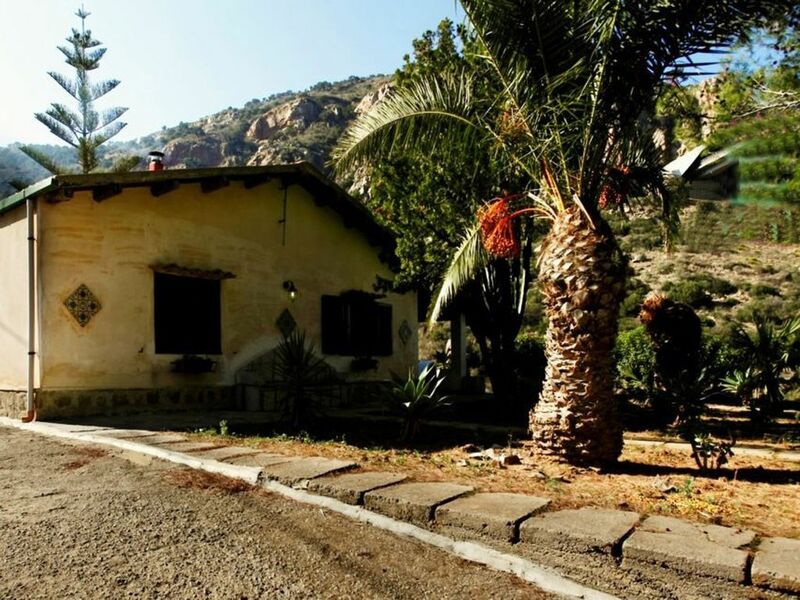 From the front of the villa you can see a view of the Sicilian countryside with typical Mediterranean vegetation, while on the north side of the house you can enjoy the sea view, however, at about 400 meters. The presence of the motorway, 400 meters away, offers easy access to visit the most beautiful places in Sicily, The nearby motorway noise is not annoying for most of our guests. Great as a base for excursions to Cefalu (7 km), 'the pearl of the Mediterranean', has a clear sea with beautiful beaches, a rich history and cultural visits. The Aeolian Islands can be visited as day trips departing from Milazzo. Palermo is 75 km. far; Piazza Armerina 80 km. ; Castelbuono 12 km. Consumption of water, electricity, gas, bed linen and towels, final cleaning of the house. This villa did all it said in the advert and more. The owner was very helpful and queries were dealt with almost immediately. It was a joi to spend a week there. The family wanted to stay forever. The log fire added to the ambience and the evenings seemed to fly by. The street it seems close, not by any annoying noise. Would recommend this villa to everyone. Thank you for your great comment. Albert. I hope to seeing you again soon. Beautiful paceful villa between hills, immersed among flowers and nature, caracteristic of the sicilian land. The wiew is brethtaking. All the facilities are available including a huge fireplace that when in use creates an unique atmosphere. The sea is accesible by car, but its a short drive to Cefalu' and its surely worth the effort. Highly raccomanded for families and romantic vacations. The owner and the caretaker are very kind and open to any request from the guests. Great!! Bonita casa en un entorno muy bello, pero carente de comodidades que la harían más atractiva, por ejemplo, carece de microondas, de tostadora, de exprimidor,de batidora, no tiene lavadora, no tienen una sartén pequeña para hacer unos huevos fritos, por ejemplo, no tienen plancha para la ropa. la habitación de matrimonio es extraordinaria, pero no así las de las camas individuales, ya que estas son muy pequeñas y sumamente incómodas. Con el tema de la basura tienen un problema, ya que hay que meterla en el coche y llevarla a 2 o 3 km. ( es un servicio que podrían hacer perfectamente los propietarios, colocando un cubo cumunitario, ya que viven en una propiedad en la misma finca). Hago este comentario de una manera constructiva, porque son problemas fácilmente subsanables y que harían de esta propiedad una casa ideal. Thanks for appreciating my house. Little things (pans, dishes, small appliances) you mention in your review, you could ask the caretaker or owner who asked several times if there was something missing, and none of you have ever asked for anything. The washing machine, as well as written in the ad, is located 30 meters from the villa in the common laundry also iron and ironing board (just ask), the toaster in the villa is available. As for the garbage, for hygienic problems, each guest must dispose of their garbage. There is no skilled personnel for this purpose. “Wonderful stay in the "Truly Sicily"
I have spent a week in August with my family at Villa Palme in Cefalu, this is a very comfortable place with a/c, wi-fi and other commodities, and also well managed by the local owner. There is a lovely covered terrace where you can enjoy an nice Sicilian wine or dinner al fresco. The Villa well situated with a lot of fresh air, palm trees and the view of the sea. (A little obstructed by the highway pillars but still very good). The Villa is located inside the Natural Park of Madonie, this is a strategic point if you want to visit most of the places in Sicily, We were able to go for the day in Places like Taormina, Etna Vulcano, Agrigento, Erice & Segesta. I suggest Villa Palme for families or group of friends that want explore the truly Sicily. Characteristic Sicilian villa, located in the Madonie Park, in the countryside with wonderful views of the sea about 400 meters away, 7 km from the center of Cefalù, surrounded by Mediterranean vegetation of olive trees and citrus. The particular position elevated with respect to the sea ensures a constant ventilation that contributes to a pleasant sensation of coolness throughout the day.